My Older boys LOVE hand held video games, my toddler always throws a fit wanting to play. I was thrilled when I had the chance to review the VTECH V.Smile Cyber Pocket. Now my toddler can have one of his on and LEARN at the same time ! They definitely make learning fun and I can see my son picking up on new things from it. It’s for ages 4 to 7 so he can enjoy it for years to come! The V.Smile Cyber Pocket is a great way for young kids to get their game on and tap into online gameplay! 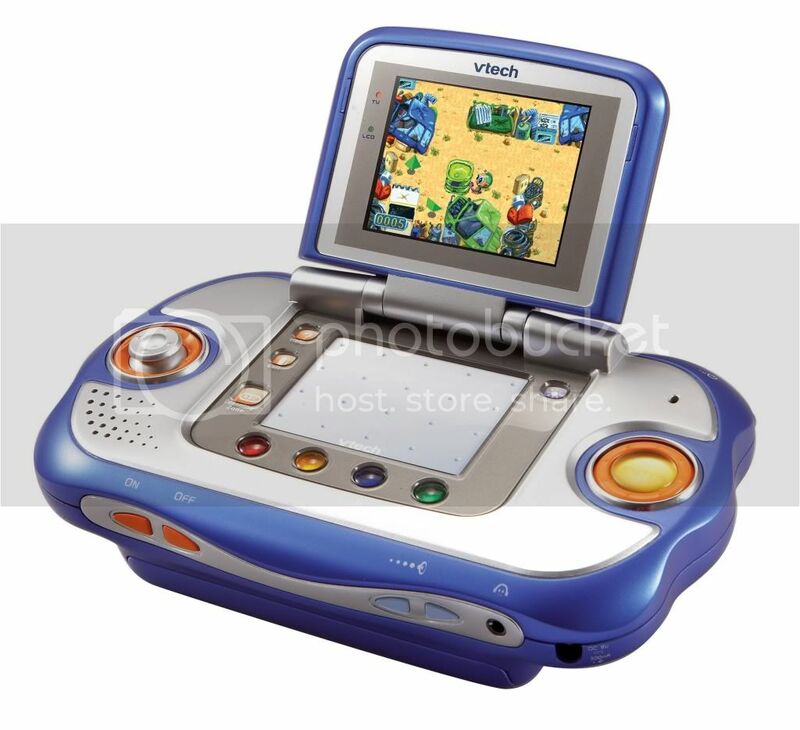 Kids can extend their play with a new online connection to unlock bonus play using the VTech V.Link™ (USB drive). The V.Smile Cyber Pocket features a compact, flip-up high resolution screen and touchable writing pad for fun, wireless video gaming on-the-go or at home. Kids can easily connect the handheld to the TV to play on the big screen. And, when it’s time to go, kids can disconnect Cyber Pocket and play on the system’s flip-up screen without disrupting their game. Cyber Pocket players can capture their scores and connect to a safe online site with their V.Link to share and compare their scores with other gaming enthusiasts. Parents can use the V.Link to track time spent on the Cyber Pocket, results and scores. A built-in microphone encourages kids to participate and sing along to activities, and the adaptable buttons for right- and left-handed players, make it easy for anyone to play. V.Smile Cyber Pocket is compatible with the current V.Smile Smartridge library and new licensed titles, including Kung Fu Panda and WALL•E. Cyber Pocket adjusts to both right and left-handed players. Which is GREAT, I know first hand that it is hard to find toys that can be used by left handed children (my middle son is a lefty). The V.Smile comes with a cord that attaches to your television so your kids can play on the big screen! It’s great that I don’t need to purchase a separate system to do this! The Cyber Pocket includes the new V.Link that lets kids track their scores and play bonus games on-line. A secure website shows kids how their game scores stack up as well as provide them with bonus games to reward their progress. It’s easy to use and encourages them to keep up the good work! There are over 40 other games available. The games are affordably priced – $19.99. I purchased my son a few games for Christmas plus the carrying case, so we have a place to keep everything and it will be easy to take on the go ! See the Cyber Pocket in action ! We have one and it's totally age appropriate! You know...I was looking at this in the store over xmas break. This may be something I buy next year for my nephew. this is right up my 3 year olds alley! I have bought 1 but i cannt find the TV connect cord??? do they have 2 verions?